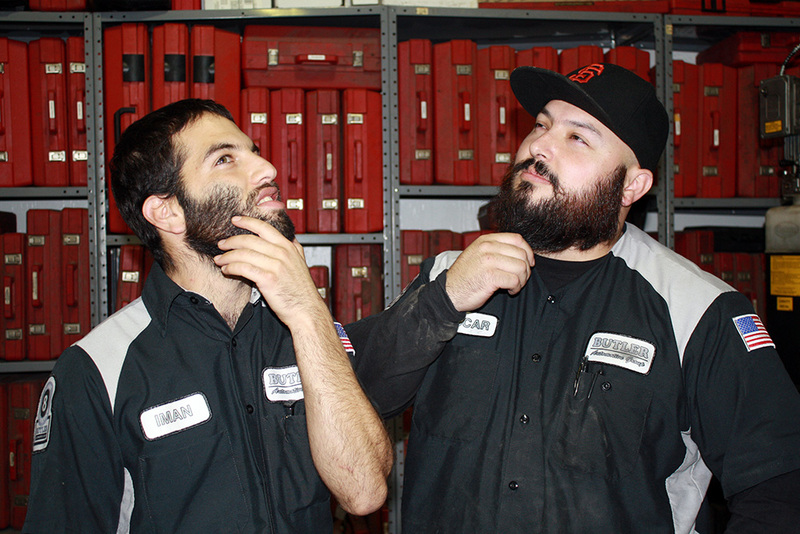 It’s the last day of October 2014, one day before the official start of “No Shave November”, but two Butler technicians are already rocking a serious amount of facial hair. Iman Pirasteh and Oscar Malfavon are famous around the Butler campus for not only their ability to grow a seriously healthy beard but for the speed with which said beard appears. Oscar’s been working on his masterpiece for a good six months but Iman’s only been forgoing the razor for a couple weeks. Depending on who you ask, the No Shave phenomenon formerly known as “Movember” (a mashup of the words “mustache”‘ and “November”), is either an opportunity to show support for, and raise awareness of, cancer, or a good excuse to be lazy. Iman and Oscar like the idea that their decreased personal grooming is somehow in line with the American Cancer Society’s mission while totally enjoying the social movement towards slacker-dom. In fact, Oscar’s well on his way to being able to claim a “No Shave 2014”!